The world-famous Planet Hollywood franchise will open its first restaurant in Malta in time for summer 2019, celebrating the glitz of Hollywood in its inimitable style. This news follows the installation of a large banner in Paceville to announce this. The restaurant chain is well known for its menu favourites, imagery of great cinema moments and events flashing on screens all over their restaurants, all presented in a filmset environment. Guests can expect the multimedia celebration found in all the Planet Hollywood restaurants worldwide featuring movie highlights and moments from Hollywood movie premieres and star-studded red-carpet festivities. These will be complemented with various memorabilia and props from blockbuster movies to bring back memories from the big screen to life. 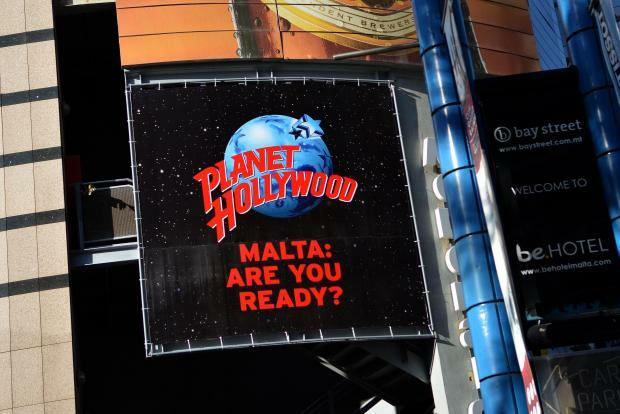 Planet Hollywood in Malta will add a fresh touch to the buzzing local entertainment scene and will be a great dining option for guests looking for a bite off their tasteful menu or else as the ideal place for a meet-up with friends over a drink. It will also serve as the perfect place to celebrate special occasions.